It should be simple. Sales professionals are paid based on results. Value selling improves results. CRM data from B2B organizations adopting value selling show that opportunities where a Value Proposition is used have 5-15% higher win rates and 5-25% higher price outcomes. Adoption of value selling should be a no-brainer. But change usually takes a nudge, if not a strong push. To get results with value selling, ensure that a few key ingredients are in place. Take a common-sense, disciplined approach to implementation based on a simple checklist. The initial benefits and successes that result generate early momentum. 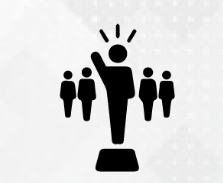 Internal promotion then spreads the word among sales professionals and sales management. One success becomes a trend. A results-driven sales culture and incentives will take over from there. A Strong Value Proposition. A Value Proposition is different from and better than a Value Calculator. Reps get lost in most Value Calculators. Calculators overemphasize assumptions and math. Value Propositions tell a story. They highlight simple messages. What do you do for your customer? What customer problems or challenges can your solution address? What are the two or three ways you deliver customer value? How are you different? Strong Value Propositions provide options to discuss quantitative and financial benefits, but first they highlight customer problems and the qualitative ways your solution can address those problems. They don’t force sales users to go too deep, too fast in customer conversations. But you need to pick a good target. Differentiated, strategically important and high ROI offerings are the right focus for initial Value Propositions. One way to assess the importance of your focus is with a Value Proposition Score. The (Number of Reps) times (Average Sales Value) times (Closes per Year) equals a score that shows the revenues that Value Selling can impact. The benefits of value selling are simple math on those target revenues: 5-15% of those revenues from higher closing rates, 5-25% of those revenues from higher prices. Increases of that magnitude should be worth the time and attention of sales leaders and sales professionals. Engage a Sales Leader. Product managers and marketing professionals sometimes think they can roll out great content themselves. 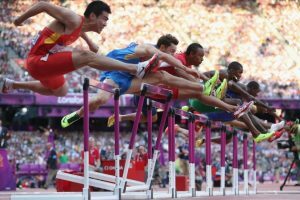 If they perform well in a sales classroom they take a victory lap. Product manager presentations are never enough. Sales change requires sponsorship by sales management. There are too many organizational imperatives in most B2B organizations that compete for sales professionals’ time and bandwidth. Sales leaders need to sponsor value selling as an important priority because employees generally listen to ideas from their bosses more closely than they listen to ideas that are good on their own merits. Good ideas coming from bosses are the most persuasive ideas of all. Sales leadership is critical to a successful rollout effort. Ideally sales leadership should participate in choosing the right offer to target. Feedback from the sales leader on Value Proposition content should be sought and incorporated. The sales leader should choose and motivate the right sales people for an initial push, including the Sales Mobilizer. The sales leader should participate in and drive a results webinar. Engage, Motivate and Support a Sales Mobilizer. A Sales Mobilizer is key to the success of an initial value selling push. A Sales Mobilizer is someone who presents to customers on at least a semi-regular basis. The Sales Mobilizer should be ultimately responsible for the execution of the initial sales rollout and that accountability should be clearly communicated by the Sales Leader. As a result, the Sales Mobilizer is the right person to test the Value Proposition and provide early feedback to product management and marketing for refinement. A good Sales Mobilizer gets comfortable with the Value Proposition, uses it in one or more customer conversations and records a video, available to other reps involved, showing how they would present the Value Proposition to a customer. This provides useful context and ideas for other reps in their call prep as they get ready for a value conversation. A good Sales Mobilizer is a team player who is ready to present with other sales team members and is ready to assist other sales people in their preparation to use the Value Proposition. The Sales Mobilizer should report directly to the Sales Leader on the value selling initiative. Engage with at least 10 Opportunities. Success in sales requires the courage to try, fail, learn and try again. One and done is never a true test of value selling. Testing a Value Proposition in at least 10 sales scenarios should provide enough experience to work out the kinks, learn what works and see how it works. The early payoffs are not necessarily hard dollar payouts: a good meeting, a target who starts to talk about their business and can’t stop, a compliment from a target customer, and/or learning enough about account specifics from a value conversation to stop wasting time on an opportunity. Closed deals follow these initial payoffs. The process of tracking results from 10 sales scenarios provides discipline and structure for a Sales Mobilizer, helping to push others to get shots on goal, following up on value conversations and capturing customer feedback. Map for Success: A Checklist. There is a process that works in getting value selling underway. 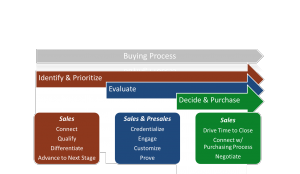 Here is a simple checklist that is effective in driving initial sales adoption of value selling at a time before there is evidence of success. Sales-Ready Value Proposition. Pick an important, differentiated product with a high score. Make sure the Value Proposition helps a rep tell a story. Focus messages on the customer while including quantitative and financial value statements. Be prepared to test and refine the Value Proposition based on direct feedback from sales reps using it. Engage the Sales Leader. Great content and hard work deserve sponsorship. Sales leaders obtain the focus that gets the results. Enlist a strong sales leader to pick team members, kick off calls, provide general guidance and ensure sales receptivity and disciplined follow-up. Identify and Support a Sales Mobilizer. Sales Mobilizers should have a stake in the Value Proposition’s success and should be incentivized to support their team members. A credible, motivated Sales Mobilizer drives testing and use of the Value Proposition by designated sales team members, providing experience in presenting the Value Proposition and experience in using it in customer conversations. Presentation Video. Recording a short video of how the Sales Mobilizer would present the Value Proposition provides a test in its own right. The act of preparing for the video, recording it and watching it improves the Sales Mobilizer’s confidence in an initial presentation. The quality of the recording improves as a result. The wider impact is that other sales people watch the presentation video, as it suits them, as part of their own preparation for initial use. The presentation video provides continuing, self-paced sales training that is often more valuable than a mandatory rollout conference call. Engage with 10 Opportunities. Active encouragement and success stories overcome the fear of trying a new approach. Monitoring activity provides a second and strong incentive for sales team members to innovate. Energetic follow-up by the Sales Mobilizer to make sure that members are identifying opportunities is important. Conference calls to compare results, with the Sales Leader on the call, generate momentum in realizing and documenting success. Complete the Initial Phase with a Success Webinar. The success of an initial small sales team is an achievement that needs to be broadcast. Waiting for the next annual sales meeting to publicize how value selling worked is usually too long a wait. Complete the initial push. Consolidate the results and the successes. Then get the sales leader and the sales mobilizer in a required success webinar to drive adoption more widely. Follow-on internal campaigns celebrating success are important, but the Success Webinar should be the main event to kick off and drive broader sales rollout and adoption. Value Propositions for Customer-Centric Selling. In a recent white paper, we provided a roadmap showing how Value Propositions support sales team objectives in light of B2B buying objectives. For account executives and sales reps, Value Propositions are useful early in the sales cycle as Flexible Case Studies in call preparation, in building sales confidence, in qualifying opportunities and in engaging customer executives. 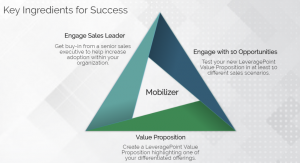 For technical sales and presales professionals, joining the team in the middle of the sales process, Value Propositions provide Customer Value Analyses as an important consultative selling tool to address presales challenges. As customers decide to purchase, the Value Proposition becomes a Shared Business Case, collaboratively agreed between sales executives and customer sponsors, that serves as a buyer’s internal financial justification to purchase and a sales team’s asset in a price negotiation. Compete with your competitors. Partner with your customers. 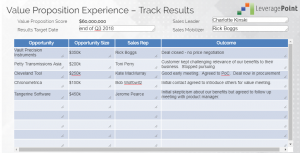 Value Propositions provide core sales content that helps sales teams collaborate with customers, communicating what your solution does for them. Value Propositions helps sales teams win.